The purpose of the Windsor Camera Club is to assist its members to improve their photographic skills through fellowship and involvement in the following club activities. The speakers chosen to present programs cover a broad spectrum of subjects. We have enjoyed lectures on composition, exposure, etc., after which members are encouraged to ask any questions which they may have concerning the subject matter of the night. Members need to get to the meeting early this night in order to submit their material for the competition, generally referred to as "evaluation night". Though not compulsory, members are encouraged to enter work for monthly competitions, these evaluations are held on two levels of experience "N" for Novice, "A" for Advanced. All members may enter Digital Entries or Print Entries in the following three categories, Open, Nature, and Assignment. Open category may be used to enter photographs of all subject matter (no restrictions). Assignment category requires the member to enter only photographs which were taken in the current year and of sufficient subject matter to fit the assigned subject for the month, the club executive gives out a list of assignments at the beginning of the club year in May. Nature category is the most restrictive in that photographs must not show the hand of man, meaning objects such as buildings, concrete, fences, wires, people, etc., also the subject matter should not be in captivity or cultivated unless the photograph is of extreme close-up nature. Following the viewing of each photograph and judging, a selected guest or fellow member will critique the members entry. The purpose of the critique is to point out how the photograph entered by the member was successful and or how it may be improved. The commentary is not unnecessarily harsh, as it is not our purpose to discourage members, but the commentary will not be soft either, as the member would like to know how to improve their work. There are no restrictions on joining our club, you only need to be interested in photography. You don't even need to own a camera. Maybe you are retired and only enjoy the social aspect of the club or enjoy viewing the images entered by other members. Membership dues at the present time are $55.00 per year. Our club year starts in September and runs until June. If you are interested in joining the club and it is not in September, your dues will be prorated so that you will only pay for the portion of the year that you will be a member. 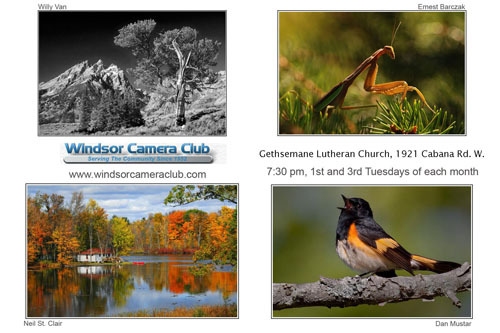 Windsor Camera Club is held on the 1st and 3rd Tuesdays of each month from September to June at Gethsemane Lutheran Church at 1921 Cabana Rd. W. in Windsor. The first Tuesday of the month is a Program night where topics, presentations or methods used in photography are discussed. The third Tuesday is Competition Night for both Digital and Print Entries. Doors open at 6:45 pm. Meeting starts at 7:15 sharp!